At long last I am finding some time to sit and write this newsletter and the intentions were to have it done a few weeks ago but we have been busy ploughing through all the orders from the Fieldays, plus our website and we have just done a 2 day show in Hamilton at the weekend, this is the 2nd one run by Bumps, Bubs & Beyond and next years one even promsies to be bigger and better. We were also on the Good Morning show last Wednesday. 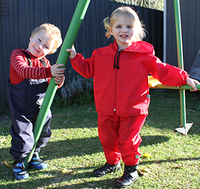 We have also been busy introducing new products to our merino range in particular, and we will leave the introductory prices till the 31st of July, plus our Fieldays waterproof special will run till then also. Kruizey K's Swaddle n a Bag, this has been designed if you dont want to swaddle your baby or they dont like being wrapped so we have come up with our new Snuggle Bag in our Merino. This bag can be used in summer and winter and is domed at the bottom for east acces to change nappy and domed on both shoulders and is on the website now, this come with a free beanie for the month of July only. Our July special price is $38.50 each normal retail is $44.50. made in our plain Merino colours and have a dreamtime animal embroidered onto the front of them, they are on special for $38.50 till the end of July. normal retail is $44.50. We also make these singlets in the longer length but they are not on special. Time is moving too fast for me at the moment and with all the bad weather we have been having we have orders coming out of our ears and working frantically to try and get them all done as quick as we can. We will try and contact all our winners over the next couple of days. We are just waiting for our web people to get it up and running for us. If you have not already gone and liked us on facebook please follow this link and like us then you will be able to enter any of the competitions/specials etc that we run there and we are also trying to reach 1500 likers at the time of writing this we were only 18 likers away from reaching it, and when we do we will give a gift voucher to the lucky person who is our 1500liker, Many thanks to all of you who have already gone and liked our page. 13th July, Gordonton Country Market. 14th July, The Kids Market, Tauranga. 27th and 28th July The Ultimate Women's Expo, Site no 11, North Shore Events Centre.